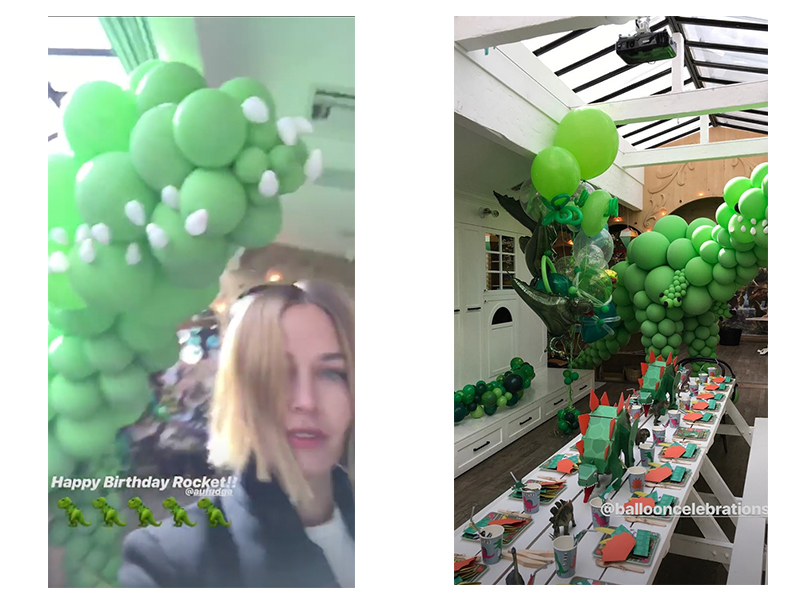 Lara Worthington’s oldest child has just turned three, prompting the model and beauty co. founder to throw an impressively prehistoric party in celebration. #YouHaveToSeeTheCake! Lara and husband Sam Worthington are parents to three-year-old Rocket and one-year-old Racer, two little boys who really are living their best lives. This party was no exception, and let us just say from the get-go that Rocket’s cake was a total standout. Not only is it excellently personalised, it features a whole bunch of very life-like and fierce dinosaurs tucked about it’s delicious tiers. A triceratops, pteranodon and brontosaurus, expertly sculpted and painted, were dwarfed by an ultra-scary T-Rex, overseeing the birthday party with his trademark tiny, tiny arms. Apart from the amazing Jurassic cake, there were more green balloons than you have ever seen in your life, as well as some brilliant stegosaurus centrepieces to even further elevate Rocket’s rad dinosaur theme. Balloon Celebrations are the geniuses behind the buoyant party decorations and a quick scan of their Instagram confirms they are the bosses of balloon. All those green balloons? They form the shape of a dinosaur guys. Pick up your jaws everybody! It’s clear that Lara and Sam absolutely dote on their kiddos and give them plenty of amazing opportunities to adventure and explore. After Amangiri, the Worthingtons promptly headed to Aspen, because one luxe resort is never, ever enough (below). All that said, Lara’s maintained her good-humoured and down-to-earth charm. Yes, she’s a regular at the world’s most exclusive resort playgrounds (admittedly she was working on her Utah trip), but she’s also a gun at flatpack furniture and a fledgling – albeit it glam – soccer mum to boot. Living her best Lara life appears to be an understatement!